The O-ring is one of the simplest, yet most engineered, precise, and useful seal designs. With over 47 years of O-Ring application experience, Niantic Seal delivers sealing solutions by applying extensive technical expertise and our fabrication capabilities. Whether off the shelf or a unique complex sealing application, Niantic Seal will deliver the right O-ring. Standard and Metric size O-rings, Quad ring, X-ring, V-ring, Square Cut, Lathe cut, Spliced ring, Spacer and washers. Material selection is based on chemical compatibility, temperature range of application, sealing pressures, lubrication requirements, application service life, quantity and price. For O-Ring design assistance call Niantic Seal’s application engineers or review The Parker O-Ring hand book. Parker Seal has two Divisions that offer O-ring seals. The O-ring Division is a manufacturer of both standard and custom sized molded elastomeric O-rings, with existing sizes that range from 1/32" ID all the way up to 30" ID. The Techseal Division is a manufacturer of both standard and custom extruded elastomeric profiles that are made into O-rings by cutting the extrusion to length, and then splicing the ends together using a hot vulcanization process. Both manufacturing methods have their own unique attributes to optimize features and benefits, and reduce costs. Molded O-rings are ideal for both low and high volume manufacture, dependent upon diameter requirements, and there are an abundance of tools in existence to cover a very broad range of standard sizes. The extruded rubber profiles offer an effective and affordable solution for large diameter sized O-rings (too large to be molded), and for unusually large cross sectional configurations. In addition, the extrusion process allows for the production of various hollow shapes, which can provide a multitude of low closure force design options. Niantic Seal, Inc. is a Parker Seal Sealing Technology Center distributor offering a broad range of customer fabricating capabilities for your individual applications. Chomerics manufactures and molds a complete line of conductive compounds to seal electronic components for EMI / RFI Shielding. Chomerics conductive elastomer gaskets provide moisture/pressure sealing and EMI shielding when compressed in a properly designed groove. They are interchangeable with standard non-conductive seals of the same dimensions. Niantic Seal, Inc. is a Parker Seal Sealing Technology Center distributor. Please view Thermal Management Materials Selector Guide. DuPont Kalrez for demanding sealing applications when you require the very best, Kalrez perfluoroelastomer parts are the elastomer seals of choice. Kalrez O-Rings resists over 1,800 different chemicals while offering the high temperature stability of PTFE (316°C).The advanced properties help maintain seal integrity, reduce maintenance and operating costs and improve safety. Kalrez parts provide reliable, long-term service when used in highly aggressive chemical processing, semiconductor wafer processing, pharmaceutical, oil and gas recovery, aerospace and petroleum applications. Kalrez production facilities are ISO and AS 9000 registered. Newman Sanitary Gasket has the largest North American inventory of FDA compliant O-rings to serve your requirements small or large. All Newman products are made from compounds formulated to match your exact applications...such as Buna-N, Viton®, Silicone, EPDM, and Teflon® fluoropolymer. All compounds are FDA compliant and some formulations have also been certified and are USP Class VI compliant. Row Inc. maintains an extensive selection of stock O-Rings in a broad range of sizes and materials including USP Class VI O-Rings. TFE-O-SIL silicone, Viton® or EPDM O-Rings encapsulated with FEP or PFA are designed to address the growing problem of sealing in the most hostile chemical and temperature environments. TFE-O-SIL combines the best qualities of two materials: FEP or PFA on the outside with its chemical inertness and an elastomer on the inside for resilience. This unique combination forms a highly effective, long lasting seal for the most demanding applications. 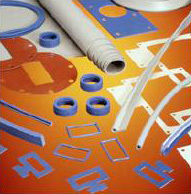 St. Gobain sealing materials include PTFE, PTFE blends, Peek, PEI, PFA, UHMW, PET and other engineered plastics. The Omni series work successfully in a wide range of applications. These performance products withstand extreme pressure and temperature ranges, as well as harsh chemical environments. By utilizing proprietary blend of material expertise and developing exact geometries, these high performance seals provide solutions for the most demanding applications. OmniSeal® spring energized seals, OmniLip® rotary lip seals, OmniFlex® elastomer-O-rings, OmniSpring™ and OmniShield™ springs are manufactured at ISO9001 certified facilities. Niantic Seal offers Global sources for quick cost comparison depending on application, market and quantity. Whether standard or custom, for small and large quantities, contact Niantic Seal to evaluate if Global is an option for your specific application. Niantic Seal delivers superior sealing solutions by applying extensive technical expertise and fabrication capabilities to the worlds best sealing products.